For years I didn&apos;t like Coldplay at all. I changed the radio station as soon as they would come on. But recently I had a change of heart. The new music from their album "Kaleidoscope" I really love and last year when they performed at Letzigrund Zürich I went to have a look outside the stadium which actually impressed me. Then I found out that Chris Martin, lead singer, is actually funny. So two weeks ago on a silly little whim I asked one of my concert buddies if she fancied going to Frankfurt to see them. Luckily she was crazy enough to say yes. After a four hour train ride we arrived at the beautiful Hotel Le Méridien close to the main station. This left us only a few hours until show time. 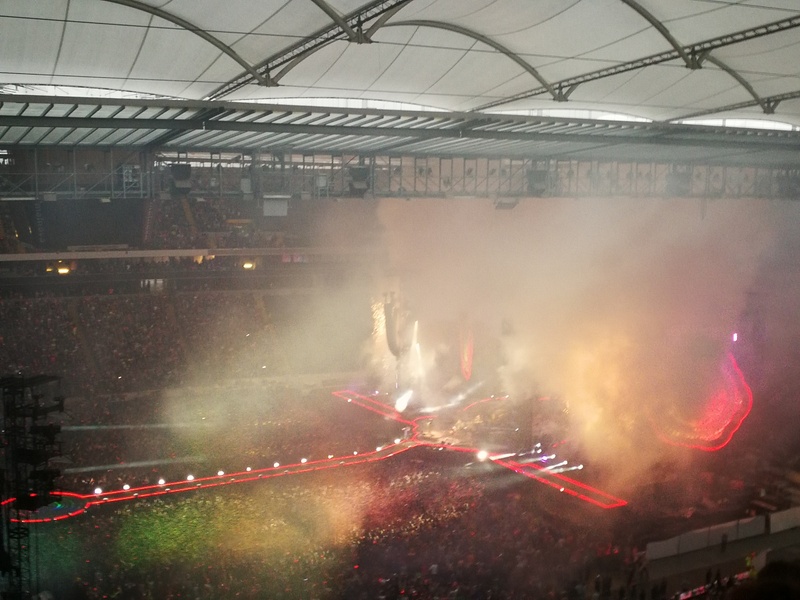 Coldplay had two supports for their gig at the Commerzbank Arena formerly known as Waldstadion which usually hosts Bundesliga football club Eintracht Frankfurt. First up was Femme Schmidt who&apos;s a German singer famous for her first single "Golden". She performed okay but couldn&apos;t get the crowd going. Tove Lo was up next and had a great 45min set. She sang her two hits "Stay High" and "Talking Body". She did a brilliant job and got me dancing and singing. I will definitely check out her record since I liked the other songs too. During the following break someone started a mexican wave which just wouldn&apos;t stop. Finally after a 15min delay opera sound started to fill the stadium - a very unsual intro. A video which showed where they&apos;ve been with this tour and two fans from Sweden, their latest stop on the tour, sent their love to Frankfurt, Germany and again two fans appeared bearing a German flag wishing us a great show. The crowd was incredible and thanks to Coldplay&apos;s brilliant idea of giving each fan a Xyloband around their wrists - a light which they can control - you could see each and everyone. I was mesmerized by it. They also lit a few fireworks and blew confetti in the air during the first song... some artists finish like this. I appreciate you coming here. I understand the hassle of travelling, queuing and paying outrageous prices for a drink but you still show up. Thank you for that! After a few old songs like "Paradise" and "Every Teardrop is a Waterfall" and "The Scientist" Coldplay changed to the B-stage in the middle of the stadium. A small minus was that a lot of people couldn&apos;t see them there because the pillars for the lights were in the way. Luckily we were able to change our position to see them better. "Magic", a favourite of mine, "Princess of China" and "Everglow" were performed there. When they changed back to the main stage I really needed a break! :-) My resting didn&apos;t last long though. After an hour and 10mins they played the song I liked most "Hymn for the Weekend". 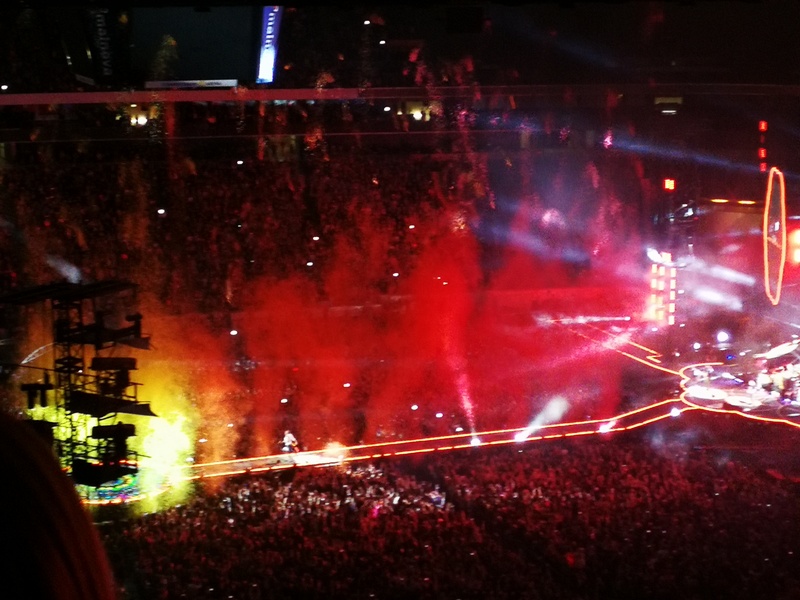 The creative team did this brilliant song justice and we saw flames rise to the top and while Chris was running down the runway coloured confetti was blown up which looked like a lovely rainbow. To calm down "Fix You" was next. They started "Viva la Vida" but stopped it after a few seconds. Chris then asked us to put our phones away for one song and just enjoy the atmosphere, the song and the moment. It was the first time I heard that famous bell clearly. It was a revelation and the song was over way too quick. They followed it with the song which made me fall in love with Coldplay "Adventures of a Lifetime". The colourful interactive show got even more playfull when they released big balloons which got thrown up by the standing crowd. 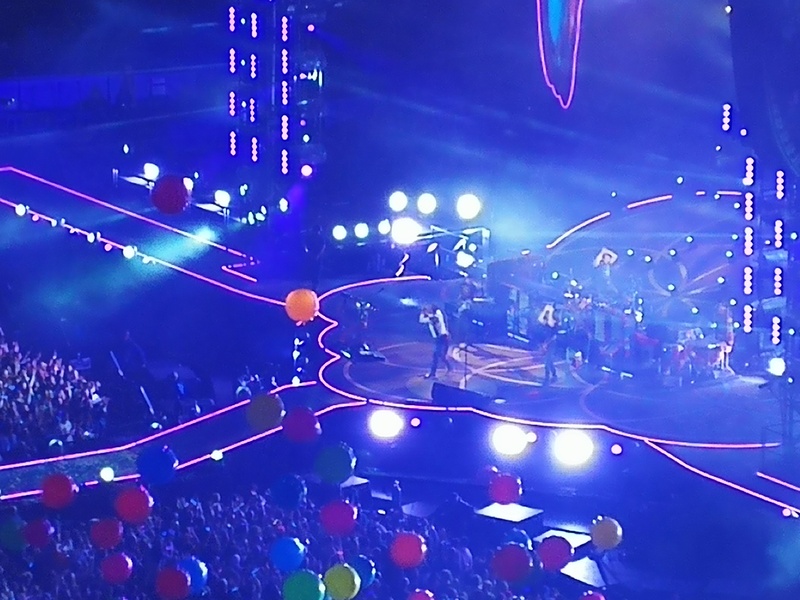 It looked incredibly fun and makes me want to be standing at the next Coldplay concert. Even the people at the back got to see them closely when the band changed onto the C-stage for a few slow songs and for us to take a break and breathe and just enjoy the brilliant musicians without any distractions. I really liked when Chris Martin introduced the other members of the band and made some jokes about them. On our way home I still could see all the lights when I closed my eyes. If you haven&apos;t seen them live, go do it! An over two hour gig with beautiful songs, amazing appreciative musicians and a wonderful show is not easy to find these days. So hats off to Coldplay, they know how to play live and to make us happy! Visit their homepage Tour for dates.